Studies from a major university examined a variety of sweeteners and found an ingredient in one that is toxic to pests. This naturally occurring ingredient FDA approved and appears in several commercially sold non-nutritive sweetener. 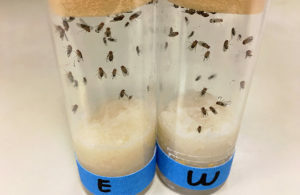 This Bait Sweetener ingredient can kill 100% of the flies tested in less than three days— far shorter than the 30-60 days flies normally live. While most non-nutritive sweeteners had no effect on the pests, our Bait Sweetener had a dramatic impact. And the pests choose this sweetener when given a choice of foods to eat. A naturally occurring ingredient that is considered food-safe. Non-toxic to adults, children and pets so bait traps can be placed even in areas where children and pets play. Comes in a variety of forms— liquid, powder, gel or spray— so it can adapt to your location and be placed in hard-to-reach spots. Keeps pest alive long enough to carry the bait back to their nests and eliminate them at the source of the problem. Selectively kills only harmful bugs. BioLogic combines the bait with foods favored by pests but not by helpful insects. Thus, just the bad bugs will eat it and the beneficial insects are unharmed. In field test against SWD, plants sprayed with BioLogic’s formula reduced larval number by 75%, greatly diminishing the pest’s potential to damage fruits and crops.